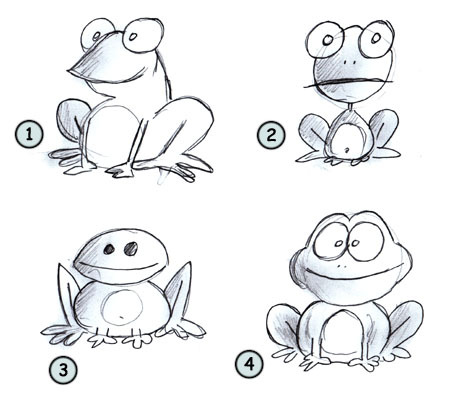 Drawing cartoon frogs: some fun facts before starting sketching! Some frogs don't have a tongue at all. Usually, a frog will live around 6 to 12 years. Frogs don't drink. They rather absorb water through their skin. How about drawing some frogs! This amphibian is well-known for his big eyeballs (1) and his strong back legs (3). 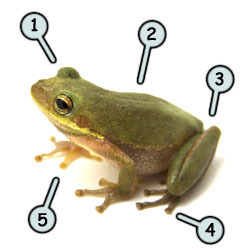 Frogs are very often represent with a green skin (2) but they can be brown, blue or even red. Also notice the digits (4) of this animal. They are usually very thin and long with an oval shape at the end. Let's jump to the next step! Notice how this animal is well designed! The head is made of an oval shape. The snout is narrower while the part that connects with the body is wider. The body is made of a big circle. The leg on the back is strong and folded on itself. The forelimb is more delicate and more complex to draw. The digits always seems to be separated one from another. Let's try to draw a simple frog. First draw a circle for the body and an oval for the head. Next, draw the leg on the back and add the digits. Continue your drawing by adding the two little arms on the front. Draw a circle on the abdomen and add details like the mouth and the eyes. If you wish, you can add colors to create a more professional drawing. It's now time to experiment and try to draw different frogs. This one is rather easy to draw (2) and the result is really interesting. If you feel more comfortable, you can try to draw a more complex frog from a side view (1). Enjoy!